I'm starting a hand quilting project, but I don't think it will fit the quilting hoops that I have. The smallest hoop I have is 20" in diameter. The quilt is going to come out to be 10"x25" so it won't fit the width of the hoop. I do have an embroidery hoop that 8" in diameter. Do you think that I could use that instead? How about adding some fabric to make the quilt bigger. After it is quilted, take the added fabric off. Seems to me this would work. I hand sew scrap fabric around the edges when a quilt doesn't fit the hoop. I have also pinned strips to the sides of the quilt and wrapped the strip around the hoop in a loop fashion. I've never had this issue, lol...all my quilts are baby to bed size. But - a friend of mine has pinned (hand) towels to the sides of her quilts when doing borders/corners to have enough to put in the hoop. Can't think of any reason not to use an embroidery hoop, as long as it is an adjustable one. 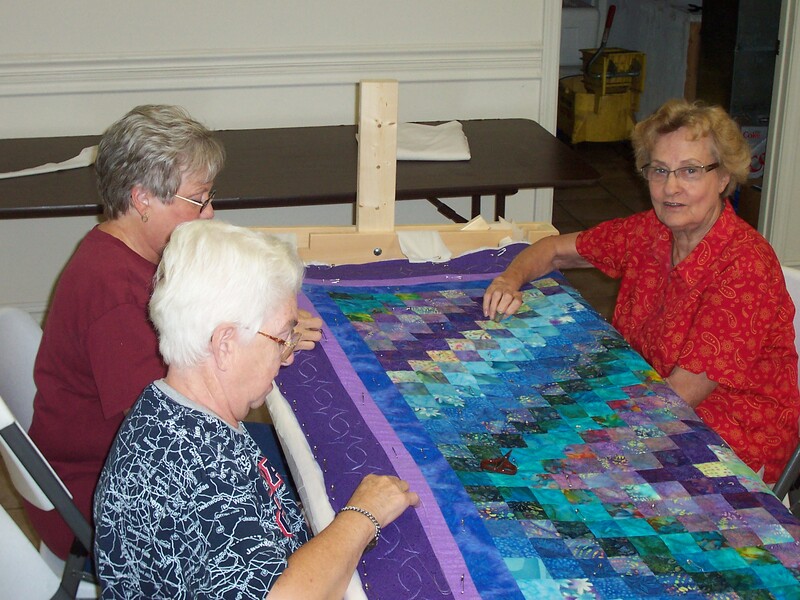 Our little church group takes fabric and pins it to the quilt to stretch it a bit. That's the white piece up near the top of the picture. I wonder if that could work for you. I knew I had it nailed. I mostly make small items and never use a frame when I quilt. I wonder if "lap quilt" got it's name from originally quilting in your lap? You can do as above suggestions, or you can quilt in your lap w/o hoop. I first learned about not using hoops via Georgia Bonesteel. She does that almost all the time. I use muslin to "extend" the surface and wrap it well, then just remove later. I usually do this when I'm crazy quilting small pieces. I know several people who hand quilt without a hoop or frame. It seems to work well for them.